nice location and staffs very comfortable room and fruitful events in Hostel. Nice bed with curtain, hot shower, staffs are friendly and the common area is lovely. I love chilling there with the in-house cat. Love the honesty bar too. 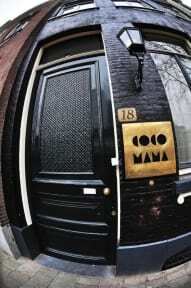 Not a party hostel but easy to walk to city centre & red light district within 20 mins. Useful map too. Nice enough hostel. Clean and in a good location right next to a tram stop. City map provided with local night spots and restaurants highlighted but kinda hard to navigate with. Light, plug socket and privacy curtain but no shelf to put your phone or anything. Lockers a take what you get situation. The picture are a bit deceiving. The building seems quite old and everything could do with some paint. The bunks are 3 beds high which if your on a top bunk (which I was) is annoying.